Abu Dhabi: Dr Amal Abdullah Al Qubaisi, first deputy speaker of the Federal National Council, made history on Tuesday when she chaired the House session. Having a woman speaker of the Federal National Council in such a short period is a huge achievement, according to Dr Al Qubaisi. 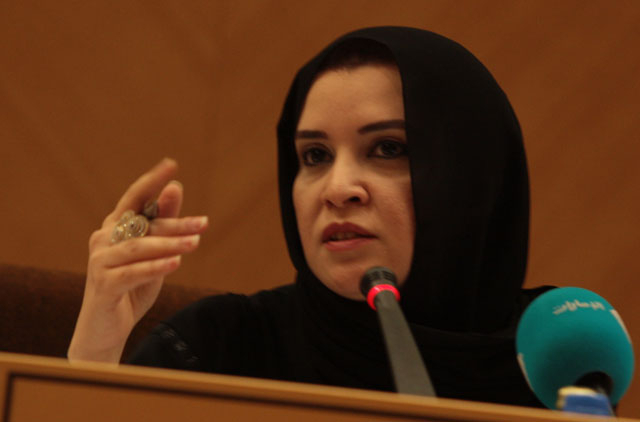 “It give me great honour to chair this meeting of the FNC on behalf of Speaker Mohammad Ahmad Al Murr, who is in Khartoum, Sudan, to take part in the conference of the Parliamentary Union of the OIC member countries,” said Dr Amal, who also made history by being the first elected woman in the UAE’s consultative council in 2006 and again when she was named the first deputy speaker of the House — the first woman to do so. Dr Amal, who represents Abu Dhabi on the House, said the UAE has recently hosted a raft of global events including the World Future Energy Summit, the International Water Summit and the World Renewable Energy Conference, which shows interest of the wise, visionary leadership to secure an international cooperation platform to bring about scientific solutions to achieve energy, food and water security for the present and future generations. “As such the FNC is required to cherish these hopes and ambitions when debating various issues and making recommendations to strike balance between demands of the public today and the future needs,” said Dr Al Qubaisi, who has passion for education, women and young people’s issues. Dr Al Qubaisi said that the people and the leaders have full faith in Emirati women who are given a chance to be FNC members, ministers and diplomats. “We hope that women in the future will be FNC speakers. I think this is the first woman in the Gulf to be deputy to the speaker of the parliament,” she said. “I have to thank our leaders and Her Highness Shaikha Fatima Bint Mubarak, Chairwoman of the General Women’s Union and Chairperson of UAE Women’s Association, who is great supporter of women,” she said. Dr Al Qubaisi, an architect whose Unesco work to document and preserve more than 350 historical sites in the UAE including Al Jahili and Al Hosn Forts was recognised with an Abu Dhabi Award in 2008, praised King Abdullah of Saudi Arabia for appointing 30 women in the Shura Consultative Council. Almost every member of the House was keen to congratulate Dr Al Qubaisi for holding this prestigious position. Dr Anwar Mohammad Gargash, Minister of State for FNC Affairs, praised the move as historical. In the 2011 FNC elections, one woman was elected and six others were appointed to the House’s membership.